Regardless of whether you have children or not, every home should have an escape plan. Waiting till the Smoke Alarm is sounding, then realizing you have never discussed what to do, can cause serious problems with escaping the fire safely. You need to have a pre-planned escape route and meeting place. The meeting place should be some place that is familiar to everyone and a safe distance from the building. If a meeting place is setup, there isn't any question if everyone got out of the house or not. Once the Fire Department has arrived, it is IMPORTANT that they be informed whether or not there are people still inside the house. A rescue situation requires a much different strategy than fire fighting. You should also have backup plans to ensure there is an alternate plan in case the route for your primary plan is blocked. When making the alternate route remember to keep the same meeting place. This will save on possible confusion over which meeting place you are to go to. Once you have established a plan you should conduct fire drills. This will assist in making the entire plan familiar to everyone in the house. 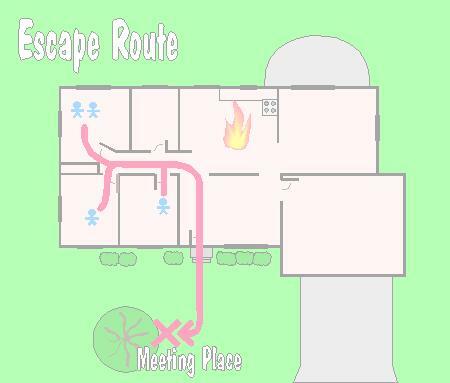 You might consider making an escape route map for the house and posting them in different areas so they can be looked at quickly if they are needed. Fire is one of the most common disasters. Fire causes more deaths than any other type of disaster. But fire doesn't have to be deadly if you have early warning from a smoke detector and everyone in your family knows how to escape calmly. Please be serious about the responsibility of planning for and practicing what to do in case of a fire. Be prepared by having various household members do each of the items on the checklist below. Then get together to discuss and finalize your personalized Fire Plan. _________Install smoke detectors outside each sleeping area and on each additional level of your residence. Keep new batteries on hand. _________Test smoke detectors once a month. Start a chart and sign it after each round of tests. _________Look at the fire extinguisher you have to ensure it is properly charged. Use the gauge or test button to check proper pressure. If the unit is low on pressure, damaged, or corroded, replace it or have it professionally serviced. Get training from the fire department in how to use the fire extinguisher. _________Draw a floor plan of your home; mark two fire escape routes for each room. _________Pick a safe outside place to meet after escaping from a fire. _________Practice a low-crawl escape from your bedroom. Try it with your eyes closed to see how well you could do in thick smoke. _________Conduct a home fire drills at least twice a year.